ŠKODA has announced the new range line-up, specifications and RRP pricing for the facelifted Fabia. Order books for the updated supermini are open now, with first deliveries expected in September. With a new, all-petrol engine range, boosted equipment levels, new safety systems and an even sharper look, the facelifted Fabia is set to raise sector standards once again. The range will feature five familiar trim levels; S, SE, SE L, Monte Carlo and Colour Edition, and as with the current model, it will be available in hatch and estate forms. RRP* prices range from £11,160 for the entry-level 1.0 MPI S hatch model to £17,950 for the 1.0 TSI 110 DSG SE L estate. The new all-petrol engine range features state-of-the-art three-cylinder power units. Two MPI engines feature indirect injection and produce outputs of 60PS** and 75PS respectively, while the two TSI engines are packed with advanced engineering, including turbocharging and direct petrol injection, enabling them to generate 95PS and 110PS. Both TSI engines are fitted with a petrol particulate filter. The most powerful of the quartet of engines can be matched with a seven-speed DSG gearbox as an option. High equipment levels have been one of the Fabia’s core strengths since its first appearance in 1999. 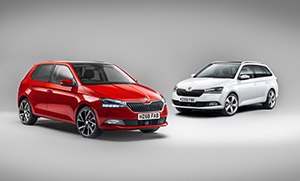 The new facelifted model continues the ŠKODA tradition with exceptionally generous equipment lists across the range. LED daytime running lights are now standard across the range, while Front assist and a Multifunction trip computer are included on all models for the first time. SE models gain front fog lights and 15-inch Cygnus alloy wheels over the outgoing model, along with Radio Swing Plus and auto up/down function for the electric windows. Colour Edition models gain 16-inch Vigo alloy wheels in white, silver or black. Customers opting for the SE L benefit from an even more significant equipment boost over the previous model. All Fabia SE L models now feature Amundsen satellite navigation, Infotainment online (for one year), lighting in the front centre console and 16-inch Evora alloy wheels. These items are in addition to the Fabia SE L’s already comprehensive specification list. The ever-popular Fabia Monte Carlo further enhances its reputation for sportiness with a range of new features. These include climate control air conditioning, LED rear lights, rear electric windows and new seat upholstery. The styling package includes a black front spoiler, black roof, black floor mats and carbon-effect dashboard trim. A new range of options has also been introduced - allowing owners to perfectly tailor their Fabia. Included for the first time are LED headlights (£960 RRP), 18-inch Vega alloy wheels (Monte Carlo Hatch only - £600 RRP) and Blind spot detection and rear traffic alert (£390 RRP). The new Blind spot detection feature alerts the driver to the presence of vehicles in the blind spot or approaching rapidly from behind when driving on multi-lane highways. The Rear Traffic Alert system monitors what is going on behind the vehicle and warns of a risk of collision when reversing. Of course, no new ŠKODA would be complete without additional Simply Clever features. In addition to the existing Simply Clever elements, the ice scraper concealed in the fuel filler flap now incorporates a gauge for measuring the tyre tread depth. And it’s not just the equipment levels that have been improved. The Fabia’s award-winning design has been given a subtle update. Building on the distinctive looks of the outgoing model, new LED daytime running lights instantly make the car more noticeable on the road. The revised bonnet and grille combine to give the Fabia a sleeker appearance, finished by the narrower headlights. At the back, the design of the rear bumper is refined with added reflectors increasing the car’s visibility - especially at night. The Fabia has been a mainstay of ŠKODA’s range since its introduction 19 years ago with more than four million examples having rolled off the production line. The third-generation supermini was launched in 2014 and has already clocked up more than half a million sales worldwide - making it the brand’s top seller in Europe and second-biggest here in the UK. It’s also proved rather popular with the motoring media, racking up a host of industry awards - including What Car? Car of the Year in 2014. Complete media assets, including press information and pricing for all ŠKODA models present and past are available at SKODAmedia.com. * On-the-road (OTR) prices are dependent on final CO2 figures - which are yet to be finalised. As soon as these are available, confirmed on the road (OTR) prices will be issued. Why is it that people find a dying battery so hard to grasp? When things that need voltage go **** up one wonders where do those volts come from? What do electric clocks need? You have good oil pressure from your figures so the problem lies elsewhere. Re: Engine using oil, and dirty plugs – is my turbo oil seal leaking? I’ll check it tomorrow see what it’s like, would the clocks do what they are doing from a dying battery? Not sure unless the SWAG unit was found laying around the warehouse!! Still listed on the website. Generally, ignore the accuracy of the dash temp gauge, it is laughable.